A traditional Visita Iglesia is organised around the few places of worship in the United Arab Emirates, covering hundreds of kilometres. In order to maintain silence, migrants pray and recite the Mysteries of the Rosary during the bus trip. More than 100,000 Filipino migrants take a virtual tour provided by Filipino Bishops’ Conference. Abu Dhabi (AsiaNews/ Agencies) – Even though they had to emigrate to the United Arab Emirates (UAE) to earn their living, in Abu Dhabi Filipino Catholics have not given up on living their faith, despite the usual difficulties and restrictions imposed in Muslim countries. On Good Friday, Abu Dhabi’s small Catholic community (pictured) went on the traditional pilgrimage of the ‘Seven Churches’ (Visita Iglesia) visiting the few Catholic places of worship that exist in the country, hundreds of kilometres from one another in some cases. Orlan Santos, who works as a clerk for Al Ain Hospital’s emergency department, was one of the organisers of this year’s Visita Iglesia. He said dozens of people took part in the event, despite the distance and desert heat. Many of them are foreign Catholics in United Arab Emirates for work. “In the Philippines, the churches are all in the same neighbourhood, but here they hundreds of kilometres from one another and we have to take the bus” to visit them, he explained. In order to maintain an atmosphere of silence and meditation, pilgrims recited the Mysteries of the Rosary during the trip. The tradition of the ‘Visita Iglesia’ was brought to what are now the Philippines by Spanish missionary in the early 18th century. The custom follows the traditional visit to seven Roman basilicas. It is something that brings together all Filipinos on Good Friday. Worshippers can choose the places they want to visit and at each church, they can meditate at two of the 14 stations of the Way of the Cross. 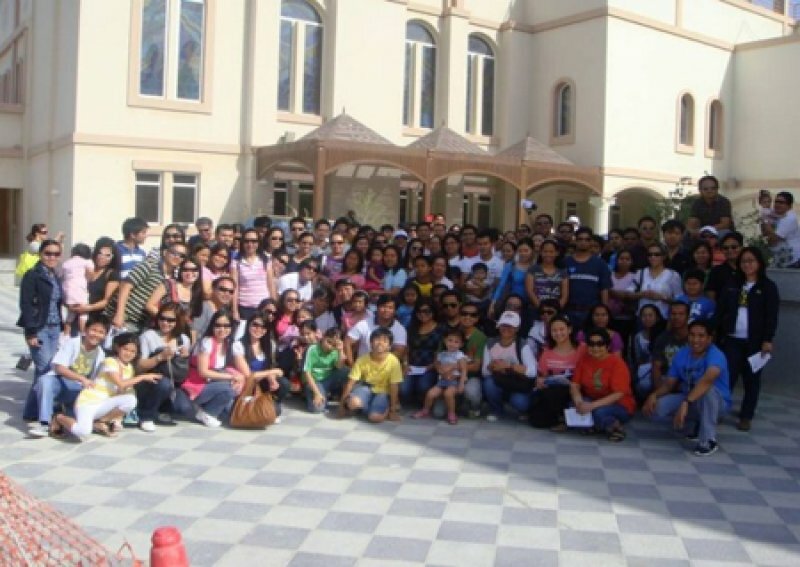 For this pilgrimage, Abu Dhabi Filipinos chose St. Joseph’s Church in Abu Dhabi, St. Mary’s churches in Dubai and Abu Dhabi, St. Francis of Assisi Church in Dubai, St. Michael’s Church in Sharjah, and St. Anthony de Padua Church in Ras al-Kaimah. Santos is one of the over 250,000 Catholic foreign workers in the United Arab Emirates, the only Gulf state that allows a certain degree of religious freedom and has not opposed Christian places of worship. About ten million Filipinos work abroad, about two million in Muslim countries, most of which ban churches and public display of the Christian faith. In order to help migrant workers, the Catholic Bishops’ Conference of the Philippines has set up a website (www.cbcponline.net); this enables overseas Filipinos to visit in a virtual pilgrimage the main Catholic places of worship in Manila. This year, the site received about 50,000 visits per day since the start of Holy Week. On Good Friday, about 100,000 visitors are expected, twice as many as last year.